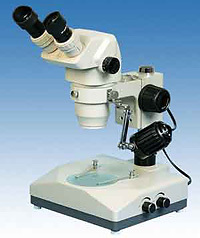 Techtrader is pleased to be able to include new microscopes from JNOEC. Nanjing Jiangnan Optics & Electronics Co. is the biggest manufacturer in China, having over 50 years experience and has established joint cooperation relations with American Leica and Japanese Olympus. JNOEC was the first microscope manufacturer in China to obtain ISO9001 quality system certification. 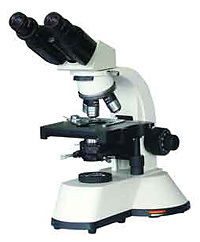 Our product range includes; student/hobby microscopes, laboratory & research microscopes, inverted & metallurgical microscopes, fluorescence microscopes, photomicrography systems, usb digital eyepiece, stereo/dissection microscopes, fibre optic illumination & fluorescent ring lights. 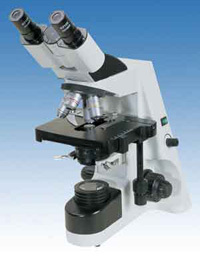 We import our microscopes directly from the factory, passing on the savings to you. All models are detailed to meet Australian requirements and are supported with a comprehensive two-year warranty on optical and mechanical components. 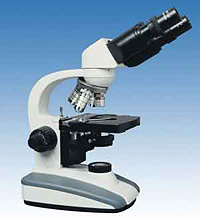 Shown are a selection of microscopes available from our warehouse. The SZ45 Series feature outstanding highly corrected optical systems offering sharp and clear images with extremely good flatness and contrast. 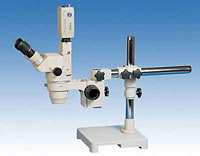 The SZ45 models with precision engineered mechanical components and a flexible modern design, will satisfy the most critical requirements for a high quality stereoscopic microscope to provide wide field, 3-dimensional magnified images. The standard magnification is 6.7x to 45x (zoom ratio 6.7:1) total range is 2x to 405x with optional lenses. The working distance is 100mm allowing easy handling of samples. Select incident and transmitted light illumination or models without inbuilt illumination. Three types of stands are available and a wide choice of accessories assures maximum versatility for a variety of applications. The SZM45 Series feature superb optics to ensure sharp and high contrast images even at the periphery of the field of view. The standard magnification is 7X to 45x (zoom ratio 6.4:1) and total range of magnification is 3.5x to 180x with optional lenses. The SZM45 models can be supplied with various types of bases and stands. 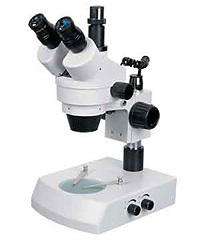 With their large zoom range and long working distance, these very affordable microscopes are ideal for high- magnification, high-resolution observation in biological research, semi-conductor and other industries. The model ZTX-E offer outstanding optics to ensure a sharp and high contrast image at a very low price. The standard magnification is 10x to 40x (zoom ratio 4:1) Two-way incident and transmitted light illumination is possibly. 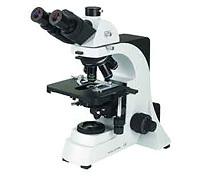 Their optical and mechanical qualities place these microscopes at the top of that sought-after category of instruments for the cost conscious laboratory or teaching facility as the price/quality ratio is exceptionally good. Featuring the latest advancements in optical & mechanical design, the XSP-136 biological microscope offers increased functionality and reliability for routine clinical and classroom work. Sturdy, precision built and ergonomically designed the XSP-136 series incorporates high quality, coated optics and bright illumination to deliver high contrast, sharp images at a very affordable price. 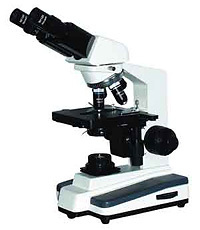 The XSZ-137 is a high performance, budget-priced, biological transmitted-light laboratory microscope for routine work designed specially to enhance operational convenience by combining innovative design and high performance optics. Featuring 300 inclined Sidentopf binocular head with the newest backward quadruple nosepiece and semi-plan objectives. 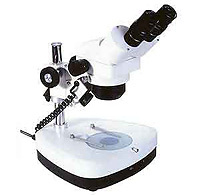 The XSZ-139 is a high performance biological microscope incorporating the latest in optical and mechanical advancements. Extra clarity and contrast is provided through new high performance colour corrected infinity optical system. XSZ-139 with its performance features built-in as standard makes it a clear choice for medical diagnosis, chemical examination, teaching & research in institutes operating on a limited budget. The XSZ-146 is a high performance biological microscope for routine laboratory work designed specially to enhance operational convenience by combining innovative design & high performance Plan Achromatic optics. The design of the XSZ-146 optimally integrates all functions enabling effective ergonmics and maximum expandability at a very low price. 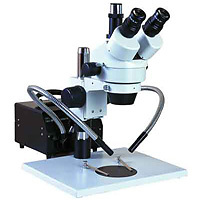 This is the optium microscope for use in scientific laboratories, agricultural industries, teaching and research institutes. The XSZ-XY high-grade biological microscope, which combines IOS optics with innovative mechanical design, provides unrivalled versatility, ergonomics and optical excellence. The IOS infinity design has succeed in achieving longer working distance objectives with higher numerical aperture. This represents a significant development in optical performance and versatility at a very competitive price.